I’ve prepared a small presentation to give an overview of software development costs. This diagram describes the costs/gain per feature. 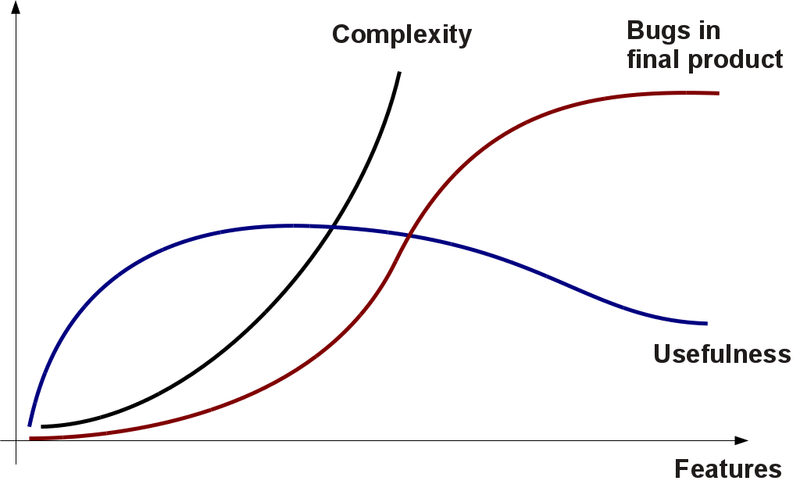 The most simple curve, complexity, is easy to understand: Costs go way up as you add features. Adding another feature to an already complex product is way more expensive than adding the first feature to a non-existing product. The number of bugs in the final product is harder to understand. As you add features, you also add bugs. The number of bugs per kLOC is an individual constant. We always make the same mistakes and we the number of bugs we create per kLOC is pretty stable, too. The number is different for each person but every developer has their own number and that number doesn’t change much unless external circumstances change dramatically. In fact if you create statistics about bugs found per team member, you can tell how many new bugs there will be after he added N lines of code (see “They Write the Right Stuff“). That means every product has bugs. If the project isn’t a complete disaster, then the team will have found a way to cope with these. Or to put it another way: If the number of bugs grows too fast, the project will either be canceled or drastic measures will be taken to reduce the flaws again. This is what the curve means: In the beginning, there will be few bugs because there are only a few lines of code. Remember: number of bugs = lines of code * individual constants. Each line that you don’t write reduces the number of defects. As time passes, the number of bugs will grow just because lines of code are written. Eventually, that number will either explode or the team will find a way to keep the number in check. The last curve is for the marketing department. It describes the usefulness of the product for a customer as features are added. A product without features (a.k.a vaporware) is not very useful for a customer. The first feature will be the most useful … or it should be: Why are you wasting your and your customer’s time with features that aren’t the most useful? But as you add features – and trust me, customers and marketing will try to get as many as they can get – the usefulness doesn’t grow as much anymore. Each feature comes with the cost of complexity: There will be more menu items, dialogs and buttons. The manual will get bigger. The customer will need to remember more to use every feature. That starts with remembering that a feature even exists and goes on with remembering how to use it efficiently. At the same time, you started with adding the most useful features, right? So additional features, by definition, can’t be as useful as the first ones. And eventually, the product will contain more features than any single customer cares about. New features will be added for new customers that existing customers don’t care about or that even get in their way (when menu items move around, for example). This is one reason why everyone feels that Google or Apple products are so easy to use: They work really, really hard to reduce the number of features in their products. Next week: Bug fixing costs. This entry was posted on Saturday, July 14th, 2012 at 22:13 and is filed under Software. You can follow any responses to this entry through the RSS 2.0 feed. You can leave a response, or trackback from your own site.